Product prices and availability are accurate as of 2019-04-22 00:50:42 UTC and are subject to change. Any price and availability information displayed on http://www.amazon.com/ at the time of purchase will apply to the purchase of this product. 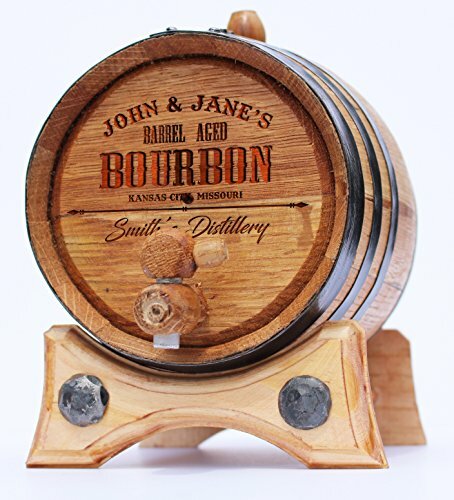 Get your barrel custom engraved with your name and details on a bourbon design. This makes your high quality, guaranteed to seal barrel even better as a gift for someone or something a little extra special for yourself. About Us- Our company was founded because we have always loved making our own spirits and liquors. We were never happy though with the quality of barrels available on the market, so we went on a quest to find the very best oak barrels available. After getting sample after sample from nearly every company in North America and rigorously testing them, we found a cooperage (barrel makers) that have standards just as high as ours. Oak is a special wood when it comes to making liquor because it is the only wood that does not rot due to liquid. A quality oak barrel like ours is 100% new oak and is meant to hold your liquor for up to 10 years or longer. Our barrels are a sense of pride for us and they should be for you too. We have barrels in different sizes, 1, 2, 3, 5, 10, 20 liters & can have Black Steel, Polished Steel or Brass for the metal hoops. We also offer custom laser engraving on each barrel for an additional fee. This can be one of our many popular designs or one of your own. If you're not up for getting a custom engraving that's ok, every barrel ships with a set of vinyl stickers that you can put on your barrel to give it that unique look. Finally, each order includes access to our 30 page brewing guide which will take you from a novice to an expert so you can make the perfect liquor, spirits, or ale. . ***NOTE TO WINE MAKERS*** You must purchase a CO2 bubbler/ air escape to allow the gas that wine produces to escape. Without it your barrel will likely leak. ?? HOW TO ENGRAVE YOUR BARREL ?? STEP#1: You will receive an email with instructions within 24 hours STEP#2: Reply with your custom engraving text STEP#3: Confirm the mock-up STEP#4: Wait for your new Custom Engraved Golden Oak Barrel. Important!!! If you don't receive our email within 24 hours, please contact us directly. ???? WHY AGE YOUR LIQUORS: When your favorite drink goes into our oak barrel, things start to get interesting. The smoky oak ads flavor and slowly infuses the liquor with a pleasant and smooth finish, revealing a rich and remarkable balance. ???? WHY CUSTOMERS LOVE IT: Golden Oak Barrel gives you the possibility to enjoy aged liquors with unique taste at home in as little as few weeks. The barrel can be used a number of times and the aging process can be monitored until you find the perfect taste. ???? HOW WE'RE DIFFERENT: Golden Oak Barrel, growing each year in popularity, uses a hand-selected blend of extra tight grain North American Oak - all sourced from one respected oak supplier and seasoned naturally. The light-medium char we give our barrels caramelizes the wood's natural sugars and enhances the flavors. ???? ETHICAL PRODUCTS AND HIGHER STANDARDS: Golden Oak Barrel is an environmentally responsible company that focuses on sustainability and treating wood as a natural resource. We offer a 90-day warranty against manufacturers defect. In the event a part is defective, we will happily replace it within the warranty period.